Descended from an ancient family of Greek silversmiths, the Bvlgaris initially confined their work to making precious objects in silver. In 1884, the first shop was opened in Rome; the flagship store was established in another location (via Condotti) in Rome in 1905. Not until the 1970s did Bvlgari expand its operations to an international market. The company is presently one of the leading makers of fine timepieces, respected around the globe. Artisans working with Bvlgari take a design concept from a simple drawing to a complicated masterpiece. Their skill and craftsmanship is evident in every line of the collection. All of their watches are created at Bvlgari Time, in Neuchâtel, Switzerland. * Also known for its perfume and eyewear line, this company focuses on style and distinction. Each watch makes a fashion statement. * The Bvlgari company employs an Excellence Program through which all personnel are trained to meet the client's every expectation. This level of attention is apparent through the impeccable service standards offered by each store. * One of the trademarks of Bvlgari is the Tubogas bracelet-watch. An elegant yellow gold serpent design with drop-shaped face was introduced in the 1980s, and effectively blurs the line between jewelry and timepiece. Lucea The newest line in the Lucea collection is a bold, though elegant black and white variation. It features a white gold case and an onyx dial. Diamond indexes adorn the face, while the bracelet is appointed with square onyx and diamond motifs. The Lucea is also available with a white mother-of-pearl dial and a white gold diamond-appointed bracelet. 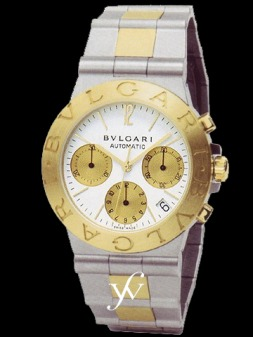 Bvlgari-Bvlgari This line is considered a classic in watchmaking. Among its newest versions is an exclusive Tourbillon watch that features a very complicated movement. There is an opening at 6 o'clock, allowing a view of the Tourbillon movement in this round case. This is a limited edition timepiece; only 25 pieces of each of two versions will be produced. Sport: Diagano Aluminium Made of aluminium (aluminum), this watch comes with date display and 2 sizes with quartz movement. Automatic and chronographic movements are also available. The watch face has a carbon fiber dial with diamond indexes and is water resistant to 30 meters. The oblique bezel design gives sporty timepiece a clean and stylish look.